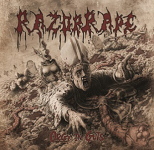 cudgel | RAZORRAPE - revenge of the hermaphrodite whores CD | CUDGEL is one of Germany´s biggest mailorder for Death, Black, Thrash Metal and all sub genres. We carry CDs, Vinyls and tons of merchandise. 2nd attack from the swedish duo 13x demented & filthy gore/grind tracks with pig squeals to blood gurgling grunts that gives this album a varied sound enjoyment blasts & grooves take turns in each song-not for the weak!